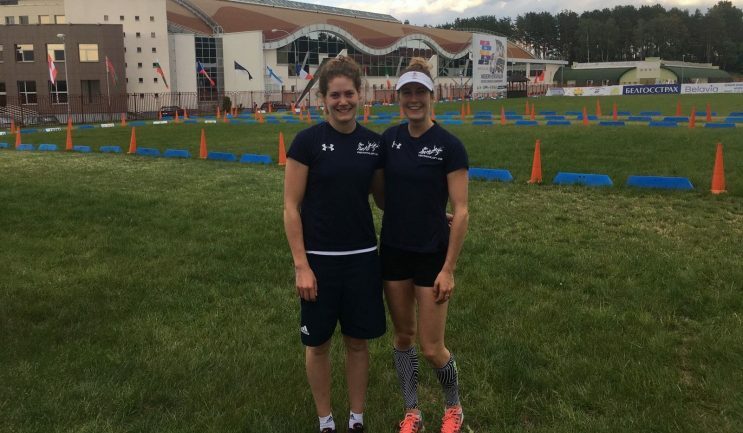 Pentathlon GB’s Samantha Murray, Joanna Muir and Kate French all qualified for the Women’s final at the European Championships in Minsk as Francesca Summers unfortunately missed out on a place in the final 36. Clitheroe’s Sam and Dorking’s Francesca were placed in qualifying Group A, beginning their day in the fencing salle. After slow starts, both British athletes finished the discipline in better form with Sam eventually securing 9 victories and 13 defeats with Frankie one hit further back on 8 victories. The duo then moved to the swimming pool where London 2012 silver medallist Sam recorded a time of 2:11.82, third quickest in the group. 2015 Junior World Champion Frankie also produced a strong performance, stopping the clock on 2:22.09 at the end of her 200m swim. It meant the British pair were 14th and 20th heading into their group’s laser run with the top 15 athletes automatically qualifying for the final. In the combined running and shooting discipline, 27-year-old Sam who claimed victory at the British Modern Pentathlon Championships last month had a time of 13:08.97, moving her up to 10th place in the group standings and guaranteeing her passage through to Saturday’s final. 21-year-old Frankie, still in her final year as a Junior athlete, battled well throughout the 3200m course but crossed the line in the 20th position she started, meaning she didn’t make it through to the final 36. However, after a season that has included a career best World Cup result of 10th in Hungary, the youngster still has plenty of positives to take forward. In Group B, Gravesend’s Kate and Dumfries’ Jo started with their 200m swim, Kate winning her heat in a time of 2:18.54 to sit 7th after the opening discipline. Jo, who is an ambassador for charity Dorothy House, was just 2 places and 1.43 seconds back in 9th meaning both Brits were well placed after the opening discipline. In the fencing hall, Rio Olympian Kate continued the form that has seen her secure two World Cup medals this season, picking up 15 victories and just 8 defeats to finish 4th in the discipline standings. Meanwhile Jo, who recorded her best finish at a major championships when she finished 5th in Sofia 12 months ago also produced a positive fence with 13 victories and 10 defeats. It meant both Brits were well placed inside the top 10 ahead of the concluding laser run. With both athletes listing the laser run as their favourite discipline, the duo could ease their way around the end of the 3200m course, both cruising into Saturday’s final with 26-year-old Kate crossing the line 2nd and 22-year-old Jo 13th. Today sees Men’s qualifying taking place with Jamie Cooke, Joe Choong, Tom Toolis and Sam Curry in action for Pentathlon GB.